We’re in the process of building our team of wine instructors and we want to see potential instructors in action before bringing them onboard. 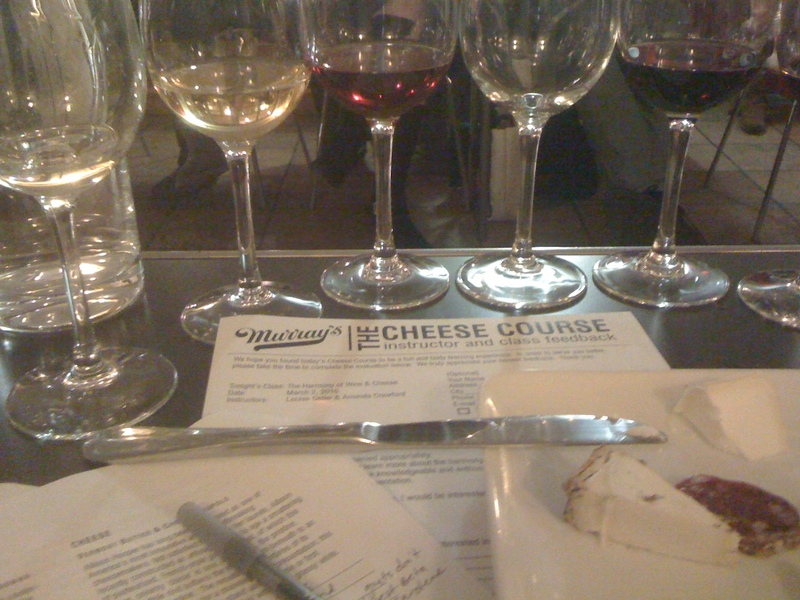 So, in the name of education, I had to go drink wine and eat cheese at Murray’s this week. 6 wines and 6 cheeses go head to head. I attended “The Harmony of Wine & Cheese” with instructors Louise Geller (in the cheese corner) and Amanda Crawford (in the wine corner). Amanda did a great job; she was friendly and approachable, she easily commanded the room, she knew her stuff and most importantly, she picked some delicious, off-the-beaten-path wines. 1. Channing Daughters Scuttlehole Chardonnay 2008. Unoaked, this Chardonnay had notes of citrus, green melon, fresh herbs and honey. From the North Fork of Long Island, the high acid style of this wine was a perfect complement to the high acid, lemony goat cheese it was paired with; Vermont Butter & Cheese Coupole. A classic pairing here would have been Sauvignon Blanc, especially an old world style, such as Sancerre, but the local Chardonnay did the trick. 2. Étoile Chardonnay Domaine de Montbourgeau 2006. From the Jura region in SE France, this is Chardonnay made in a purposely oxidized style, giving lots of nutty notes (think fino Sherry). The funk of the wine helped to offset the intense fruitiness of its cow’s milk cheese partner; Jura Erguel. This pairing illustrated, “what grows together, goes together”. 3. Grignolino “Pogetto” La Casaccia 2008. gree-nyo-LEAN-oh is native to the Piedmont region of Italy and tends to be pale-colored with lots of red berry notes, some spice, high acid and low tannins. Tannins and lactose are not friends and when paired together will often yield a metallic finish. This fresh, fruity and tart wine was a swell partner for the fruity, floral, washed rind cow’s milk called Rubloz, from high in the western, French-speaking part of the Alps. 4. Lambrusco “Bocciolo” Ermete 2007. Like raspberry pop rocks, this wine dances on the tongue. Say what you will about Lambrusco, but a fruity wine with a bit of sparkle and a bit of sweetness is just about the perfect thing when there’s salty meat or cheese involved. The cheese pairing was Podda Classico, a cow/sheep combo aged for just over a year from the island of Sardinia. 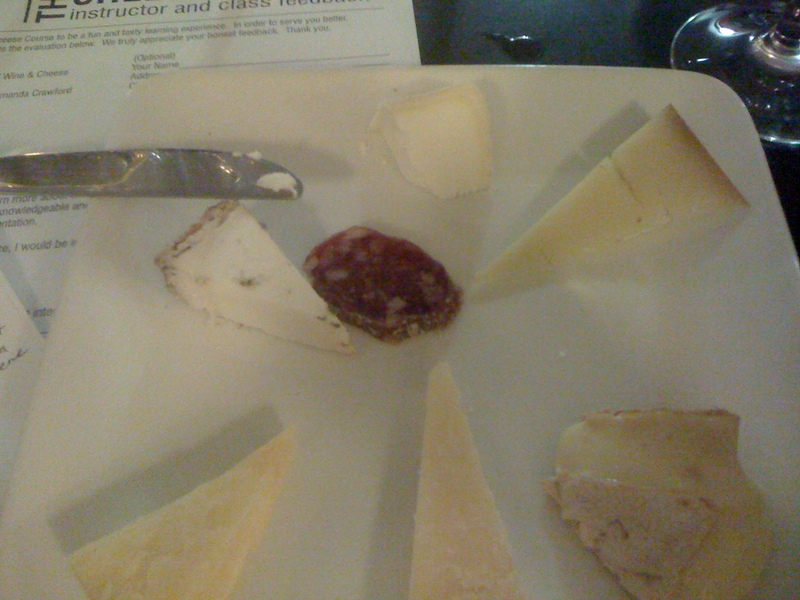 The cheese was crunchy, salty, nutty and intense, but once Lambrusco was added to the mix, both went down easy. 5. Viña Bosconia Reserva, Lopez de Heredia 2001. The current release from this very traditional producer had notes of pomegranate, dried cherries, black tea and rose petals. The dill and coconut from the American oak were evident, along with a bit of musty funk. It was paired with Mrs. Quicke’s Cheddar from Devon, a traditional, cloth-bound cheese with intense horseradish and damp basement notes (certain bites were reminiscent of corked wine). The funk of the two proved a pretty partnership. 6. Alvear PX Solera 1927. From the Montilla region in southern Spain, this is a fortified wine made in the style of Sherry (think solera system). The grape is PX, Pedro Ximénez, and the wine had notes of prunes, marmalade and toasted hazelnuts. While super sweet, it still finished very clean. A classic pairing with a sweet wine is blue cheese. Louise instead went with Monte Enebro, a salty little devil of a goat cheese from Castilla y León, Spain. This was hands down the best pairing of the night.